I just picked up my first pair of NMD’s a few days ago so figured I’d do a comparison to the UltraBOOST. I’m generally not a fan of the NMD but got a great deal on a first release NMD Runner PK so went for it. Two things I wanted to point out. 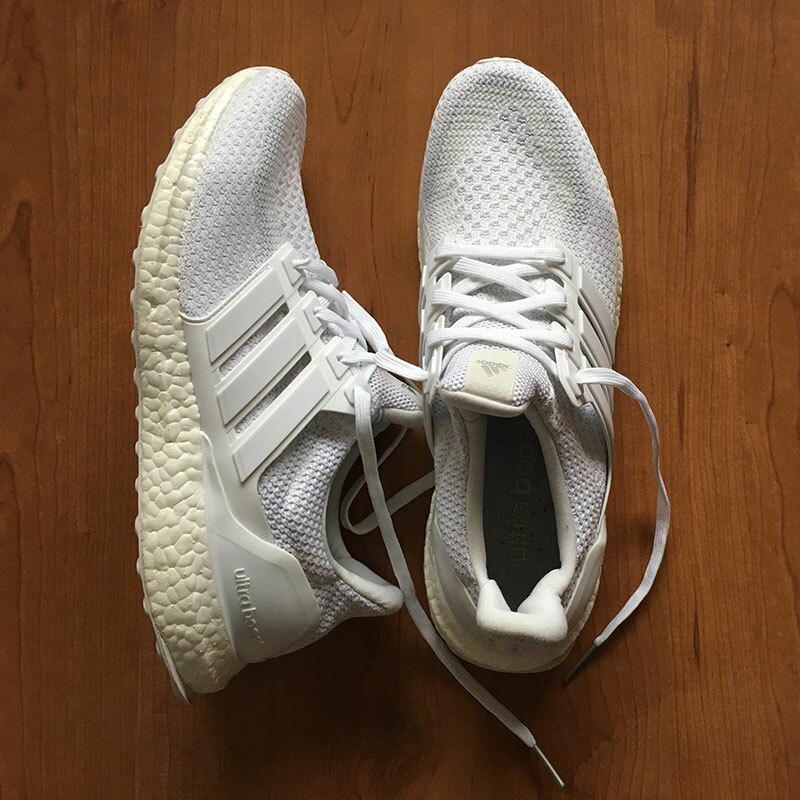 First off, although both white soles look similar, the UltraBOOST are a lot more softer and much much more comfortable. The NMD are a less cushy making them less comfortable especially if you’re used to the UltraBOOST. The other thing I noticed was the fitting size. 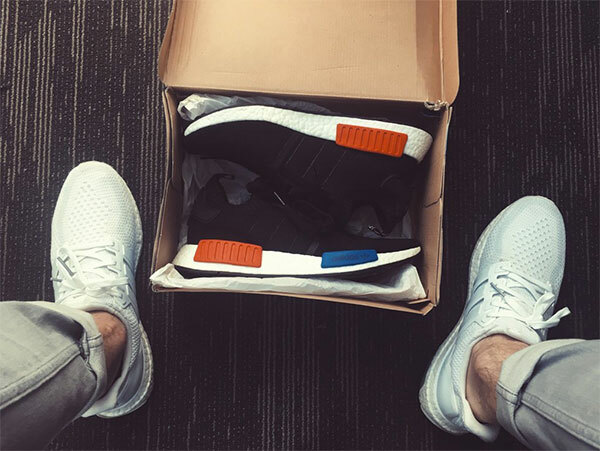 I usually wear size US11 (Nike, Adidas and just about any other brand) but the NMD are NOT true to fit so I got a pair of US10.5 and I could probably have even gone with a US10. If I had gotten them in a size 11 like my UltraBOOST they would have turned out to be too big. So just two things to keep note of if you’re considering a pair. The other day when I posted about cleaning UltraBoosts a reader asked me how I cleaned my suede sneakers. I didn’t have an answer since I hadn’t had any success cleaning the suede sneakers I had. In fact, because I had so much trouble cleaning my suede sneakers I decided I wouldn’t ever buy any again. But, a reader mentioned he used the laundromat Delicates to clean his suede shoes so I decided I would send my sneakers out to get cleaned as well. I called Delicates up but they wanted KD15 to clean my sneakers. That might be worth it if they were Yeezys or expensive sneakers, but the sneakers I wanted to clean cost me like KD40 new so wasn’t going to spend 15 getting them cleaned. I then decided to use the new app KLEAN. The cost came out to be KD2.750 including pick up and delivery. It took them two days and I just got back my sneakers this morning. They’re clean again! I’ve had two white pairs of Ultra Boosts, the first pair I used to clean with Jason Markk’s sneaker cleaner and brush. Problem was it didn’t clean that well and the brush kinda fucked up the material. With my second pair I just started throwing it into the washing machine and putting it on a quick cycle and the results are perfect. 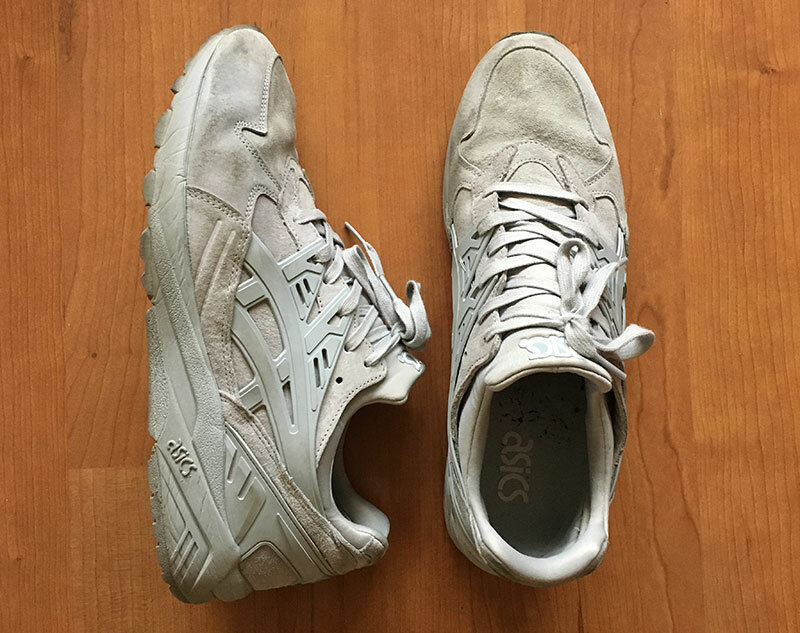 I just remove the insoles from inside the sneaker and throw it into a washing machine with a towel (reduces the banging sound). I don’t even remove the laces. 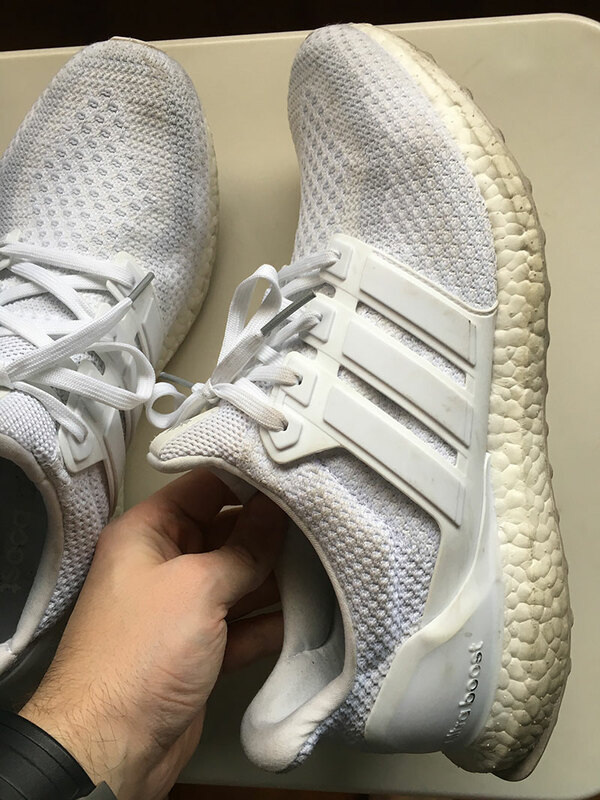 I also don’t use bleach, just regular detergent and the result is a like new brilliant white Ultra Boost as you can see in the before and after pictures. I now do this once a week since the white gets dirty fairly quickly. It also drys quickly, if I wash the sneakers at night, they’re dry and ready to wear the next morning. 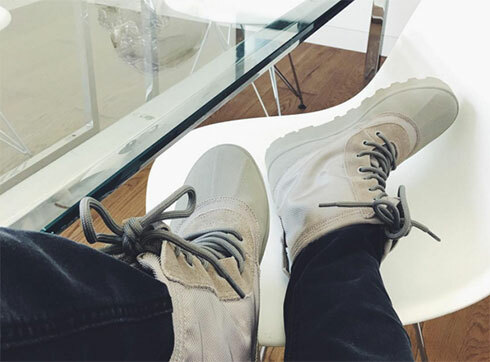 I got my Yeezy 950’s last week and they’re half a size too small for me so I put them up for sale in the classifieds section. They’re brand new and I’m selling them for KD210 which is the retail price + shipping (180+30). It’s a great deal since they’re sold out everywhere and currently cost around KD265 on the grey market at least and that’s not including shipping. I’m also willing to trade with a size US11. The Yeezy’s I’m selling are in the “moon rock” color, they’re size UK10 (US10.5). They fit true to size so if your sneakers are UK10 then these will fit you perfectly. 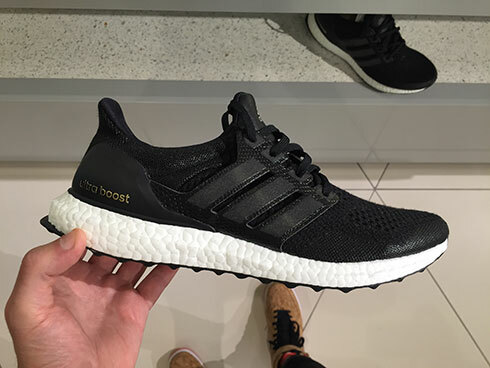 The Adidas Ultra Boost series of sneakers is back in stock in Kuwait. 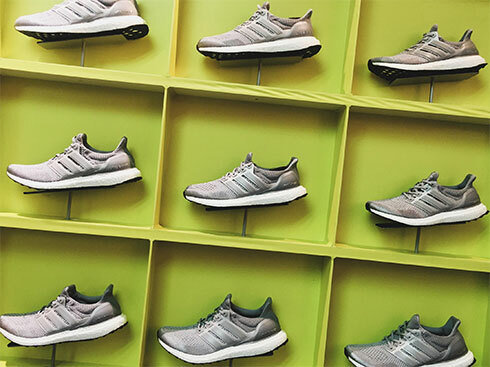 I was at the Adidas store in Al Hamra Tower yesterday and spotted the grey ones pictured above. I own the same pair and they’re super comfortable. Only issue is they’re selling for KD73 (or 76 not sure) here in Kuwait which is expensive. I bought my pair online for around KD60 with shipping. 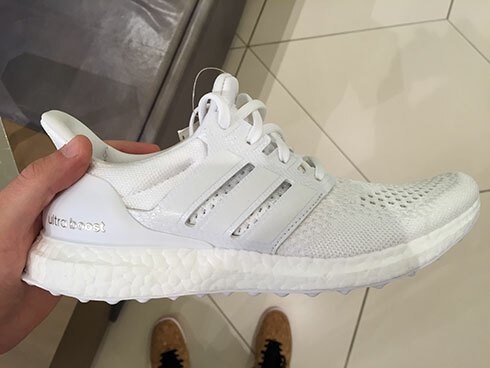 I was at Harvey Nichols earlier today and spotted a pair of triple white ultra boosts as well as black ones. At first I thought they were the regular ultra boosts but turns out they were the James Carnes x Dirk Schonberger editions. 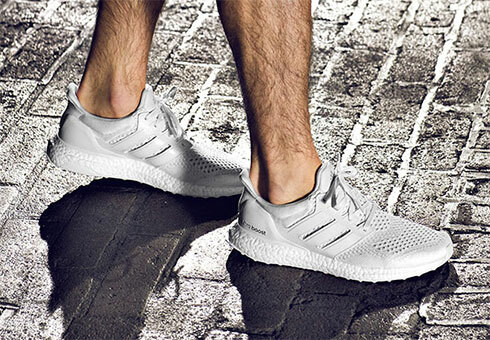 What sets these two apart from the regular and popular ultra boosts is the material used. The black version is made using wool fibre and has reflective detailing while the white version is made with Dyneema fiber, an ultra strong and lightweight material. For some reason though Harvey are selling the pairs for KD110 which is far more than the KD70 retail price in the US and KD80 retail price in the UK. 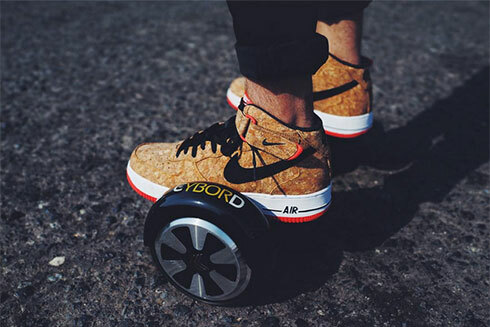 When Nike released the Air Max 90 in cork back in April, I loved the concept but hated the way they looked. They were fugly in pictures and worse in person and I just couldn’t bring myself to buy a pair. Then Nike released the Air Force 1 mids in cork around 10 days ago and I knew I had to get one. They looked so much better than the 90s and I right away knew how I would wear them and quickly proceeded to order a pair. I just got them in the mail this morning and they look even better in person than they do in photos. They’re super hot and really easy to pull off since they work well with black jeans. Just got my first pair of New Balance ever, the special BAIT x G.I. 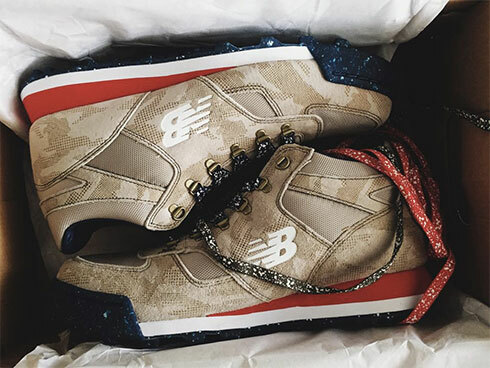 JOE x New Balance 710 “Roadblock” edition. 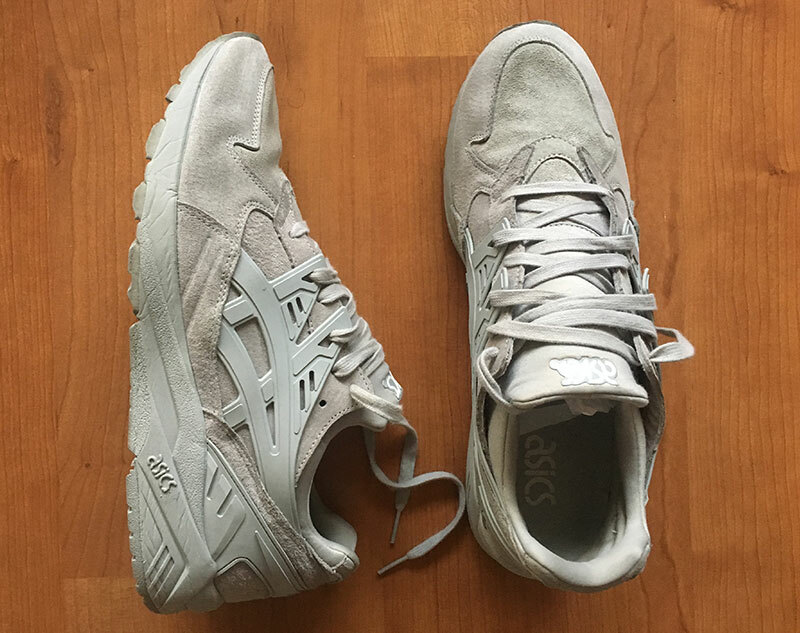 Currently trying to get a pair of a Reebok X Kendrick Lamar Ventilator without having to pay an arm and leg for it. Update: I picked up a pair of grey ultra boosts and a pair of white easy boosts and I have to say they’re the most comfortable pair of sneakers I currently own.